Teach incrementing and screen interactions! Each box includes 10 sets of 10 supercards (100 total cards! ), 30 sheets of fun stickers, and a Teacher's Guide. The projects inside this sports-themed box provide practice using arrays and simple array commands. 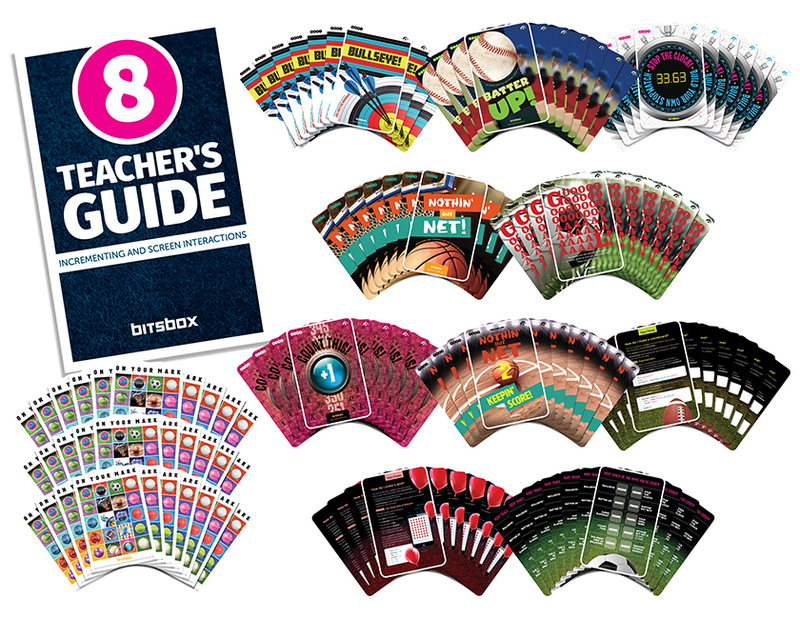 The Teacher’s Guide explains the use of incrementing and the Bitsbox touch, touching, and untouch commands. There’s also a glossary for each coding project detailing project complexity, coding concepts included, instructions on how to use the app, suggestions to alter the app, and a URL to see the app in action. Bullseye! : Archery's way more fun with unlimited arrows! Batter Up: The pitches come fast and furious. Stop the Clock: Build your own stopwatch. Nothin' but Net! : How many free throws can you shoot in a row? Goooooooooooaaaaaaaaaaaaaaaal!! : Out maneuver the defenders to score as many goals as you can. Count this! : Tap to keep track of your achievements. Nothin But Net 2: Keepin' Score! : Make you game even cooler with a scoreboard! How do I make a scoreboard? How do I make a grid?